One of my favorite childhood memories is laying in my parents' waterbed (which was too hot to sleep in but great to get warm when you're little) and listening to my dad read the Hobbit. It became my favorite book long before I ever read it myself. 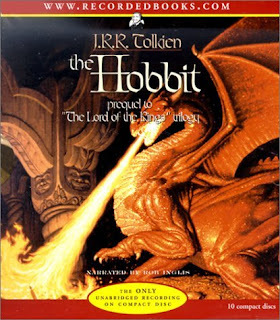 My dad did the trolls' voices (turns out he censored things a bit for my little ears) and smaug's voice, and to this day, this story makes me feel warm and safe. I enjoy reading it to my kids too. My appreciation of the book hasn't diminished as I've read other works of fantasy. The lanugage is rich and cultured, and the personalities of the characters seem very real to me. The story is good for bedtime reading to young children because it progresses from adventure to adventure. As an audiobook, it's quite good too. The reader, Rob Inglis, does a fair job on the voices. I don't care for his singing so much, but then I didn't care for the songs in the story anyway. 9 out of 10.